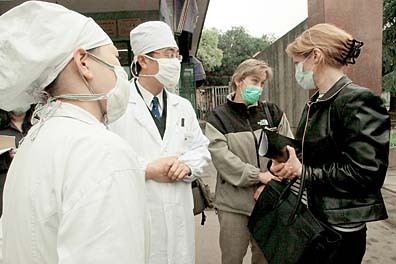 Foreign workers in China question medical personnel at Shanghai Pneumonology Hospital about severe acute respiratory syndrome. About 130 local businesspeople who want to do business in China got encouragement -- but mostly advice about the pitfalls of doing business in the country -- during a videoconference yesterday with representatives of the U.S. Commercial Service in Beijing. Billed as "Breakfast with China ... in the Afternoon," the lively two-hour live session at the Hawaii Convention center, was hosted by the state Department of Business, Economic Development and Tourism along with the U.S. Export Assistance Center. The team assembled in Beijing was headed by Thomas Lee Boam, senior commercial officer at the U.S. embassy. Boam said the outbreak of severe acute respiratory syndrome and the government's attempts to contain it are the main items occupying attention. "It's the only topic we're talking about now around here," he said. "Beijing has come to a standstill. There was pretty much no one on the street this morning." But once the outbreak is contained, things could change quickly. Pent-up demand means that the pace of business will increase, likely in late summer and early fall, Boam said. With the current lull due to SARS, he said now is the time to get ready for when business picks up. "Don't be hesitant to plan and strategize for China entry right now. If you wait until you see happy talk on the news, you'll be too late," he said. Even the SARS outbreak has created business opportunities for U.S. companies. The Chinese government recently inquired about obtaining heat-sensing equipment to detect people with elevated temperatures and also requested disposable ear thermometer covers. "These types of products are needed desperately. Luckily, we were able to act immediately," Boam said. The 2008 Olympics in Beijing and China's entry into the World Trade Organization are creating huge opportunities for those looking to do business in China, Boam said. "The growth rate is absolutely phenomenal. U.S. exports to China are up 37 percent in the first quarter," he said. But for all the opportunities in China, there are plenty of failures. Boam and his team who have seen the business failures and heard the horror stories from U.S. companies doing business in China had plenty of cautionary examples of what not to do. Many situations can be avoided with some planning. For example, having a dispute resolution framework in place is a key element of any business relationship. While the U.S. Commercial Service is there to assist companies doing business in China and will help mediate when there is a problem, it cannot successfully resolve every situation. "We are not a panacea for all trade dispute problems," Boam said. For example, one of the biggest issues in doing business with China is also one of the most basic -- getting paid. Most of the time, the difficulties relate to getting the last payment, Boam said. "Our No. 1 concern for you is that you get paid. We see too many American companies not doing due diligence on who they are doing business with and therefore not getting paid a lot of the time," he said. Boam recommends a minimum 70 percent advance payment for goods being sold and a letter of credit for the balance, preferably from an American bank. Another area of trouble concerns contracts and they way they are negotiated. Chinese negotiators will often come back at the last minute and try to re-negotiate what's already been agreed to, Boam said. "It's called a "claw back" and will often happen on the last day. It drives Americans crazy and even if you sign, the claw backs will continue, so if it's not a good deal walk away and be tough," he said. Another huge problem is intellectual property. "IPR violations are still rampant. We estimate 30 percent of products are counterfeit. It's not just DVDs, its textbooks, pharmaceuticals and lots of other products. We even found a local company in Beijing that had copied our Web site and put it out under our name," he said. The upfront advice is important for companies considering doing business in China, said Johnson W. K. Choi, president and executive director of the China-Hawaii Chamber of Commerce. "This kind of session will weed out those who are not serious, so it's good," Choi said. Hawaii companies should consider partnering with larger firms on the U.S. mainland to enter the China market, given the enormity of the Chinese economy, he said. "We are so small here," he said. "I've been trying to encourage people to partner up with California or New York firms." However, all U.S. companies need to be cautious and be prepared, Boam said. "This is not for the faint of heart," he said. "If this is your first time you might want to try Canada first."